Je soustanoviteljica skupine Soogledi, ki je bila angažirana kot družbeno kritična skupina skozi umetniške intervencije, performase in javne debate. Kot refeleksija na zvočno onesnaževanje je bil v Železarni Ravne izveden performance za glasbila, zbor in železarsko nakovalo. Delo skupine je bilo 2009 predstavljeno v Linzu na Ars electronici. Med leti 2006 - 07 je Ana Pečar sodelovala s skupino BBM (=opazovalci upravljalcev strojev), s sedežem v Berlinu v projektu "Tehnologije političnega nadzora". V avtoričinem video delu je družbeni komentar veliko subtilnejši. Njeni videi so vključeni v zbirke Koroškega regionalnega muzeja, Slovenskega video arhiva (DIVA), Evropskega arhiva medijske umetnosti, spletni katalog Earth water catalogue in Galerijo Apart v Rimu. Ana Pečar je prejemnica štipendije Vlade Avstrijske Štajerske (2012), Leon Levy fundacije (2012), Roberto Cimetta štipendije (2011), Leonardo da Vinci štipendije (2010) ter delovne štipendije Ministrstva za kulturo Slovenije (2012). She initiated Coexamination group that was engaged in social criticism through artistic performances, public interventions and open debates. Reflecting on noise pollution, a performance was held in a steel factory where the anvil was used as a main rhythmical instrument. The group's work was presented at Ars electronica in Linz. Through 2006-07 Ana Pečar collaborated with Berlin based group BBM (=observers of operators of machines) in the project »technologies of political control«. From 2013 onwards she cooperates with Oliver Ressler. They create platforms for exposing unsolved questions of protagonists that open into universal issues. Their work was exhibited in US, Italy, India, Canada and Croatia. In her video work the social commentary is much more subtle and intertwines with mythologies and composed artistic spaces and imagined symbolism. Pečar's videos are part of Carinthian regional museum collection, Slovene video archive (DIVA station), European Archives of Media Art, and online Earth water catalogue (an artistic initiative to raise awareness, understanding and appreciation of water, initiated by Uwe Laysiepen – Ulay). Ana Pecar was admitted to a three-year project (2010-2011) in Milano – NAO (=New authors today), aimed at supporting young talented artists in the process of creating multimedia works. 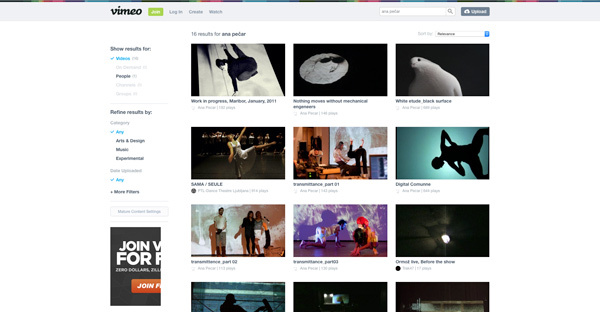 An intermedia performance, derived from the program was presented at Tec art tecco performing festival in Milano and International computer festival in Maribor. She created a piece for a dancer and technology “Digital commune” performed in Ljubljana, Belgrade and Skopje and participated in a three hour long performance online and live with Slovene’s topmost artists from diverse creative fields “trasmittance#2”. As a live video performer Pečar appeared on many local and international venues and won the national competition in vj-ing in 2006. She regularly publishes art and creativity related articles and (video) interviews. Ana Pečar received Government of Styria Stipend, Leon Levy foundation grant, Roberto Cimetta grant, Leonardo da Vinci grant and a full year stipend (2012) from the Ministry of Culture of Slovenia.